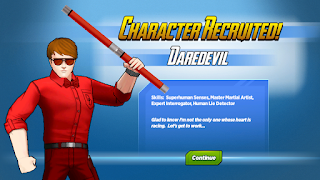 MARVEL AVENGERS ACADEMY: Daredevil Special Event Live! 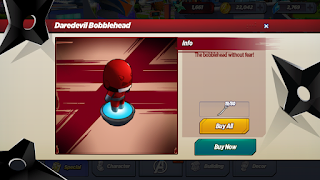 The Daredevil Special Event is here!! How do I participate in the Daredevil special event? 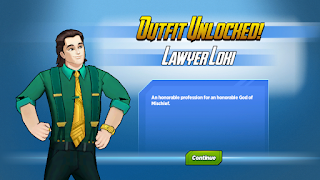 In order to participate, players must download the latest update, be at Academy Level 5, and have built Van Dyne's Outfits. The first quest is the "If You Can't Stand the Heat..." quest line. Finish it to begin unlocking event content. When does the Daredevil Special Event event end? The event ends on September 22 at 6 PM EDT. How do I unlock the Academy Courthouse? Finish the quest "The Court is in Session" to repair the Academy Courthouse! How do I earn Relics? After you purchase the Sacred Bell from The Devil's Due, you will be able to generate Sacred Keys from the Sacred Bell. These Keys are used to open the Relics that can be found in Hell's Kitchen. How do I defeat a Ninja? Higher Quality Relics are guarded by Hand Ninjas. 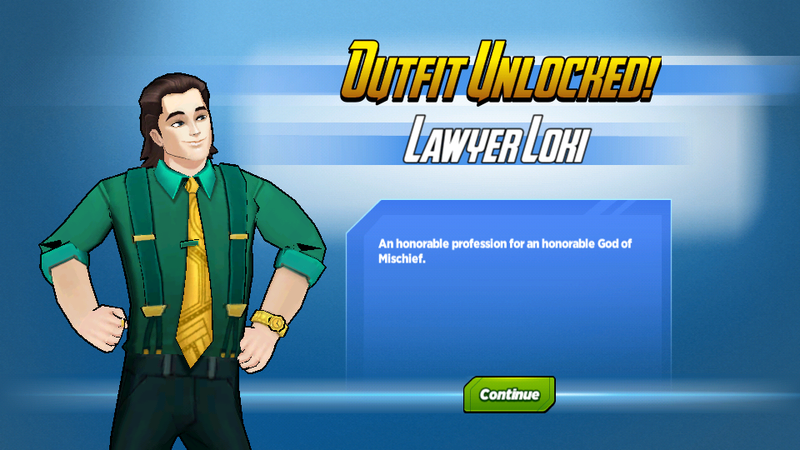 To fight Ninjas you will need Loki's Lawyer Skin, Jessica Jones, or Daredevil. You will also need 6 Anti-Toxins to protect you from the Ninja's weapons. Why is my generator dropping less items than advertised? For this event, generators drop in batches. Items are created at specific time intervals and are stored in your generator for 24 hours! Check back regularly to claim your items. WORLD NEWS: TRIAL OF THE MILLENNIUM! Pepper Potts: We're getting killed in the news outlets and social media. Kingpin turned everyone against you and the Academy. Nick Fury: We'll be fine. We've helped a lot more people than we've hurt. And we're their only hope for what's coming next. Pepper Potts: Kingpin is demanding that you stand trial to explain the circumstances around the A.I.M., Hydra, Chitauri and Symbiote attacks, and step down as Director of Avengers Academy. Kingpin: The time has arrived, Mr. Castle The pieces are in place, and I'm ready to make my move. Punisher: Quit talking about it, and do it. Kingpin: I'm the Kingpin of Hell's Kitchen, and you're my Punisher. Together, we'll clean up Avengers Academy just like we did our school, and recruit their students into a properly organized and efficient organization. Punisher: Just tell me which ones deserve to get hit. Black Widow: We need to collect clues to find out what Kingpin and the Hand's ninjas are planning. Iron Man: You're so happy right now. Black Widow: What are you talking about? Black Widow: Fine. It's the best day ever. Kingpin: The Punisher and I will keep them occupied and distracted. Protect the relics at all costs. Kingpin: Are you quiet because you don't understand me or because you're being stealthy? Kingpin: Just protect the crates or you'll find yourself inside of one. Jessica Jones: Whatever we have to do to free Luke, Hellcat, Elektra, and Iron Fist. Loki: Their weapons are lace with poison. Armor-Man is trying to create a more modern anti-toxin, but in the meantime, we'll just have to use the few traditional anti-toxins we can find. Jessica Jones: We should probably just try not to get stabbed. Loki: Yes. That's obviously the ideal scenario. Jessica Jones: Thanks. Do you think Elektra is still working with the Hand? Jessica Jones: Elektra does whatever she wants whenever she wants. That's my favorite thing about her. Jessica Jones: I could use your help fighting these ninjas to free my friends. Loki: I'm extremely sympathetic to your concerns, but I'll continue to do whatever I please while ignoring everything that you say. Jessica Jones: That's fine. I'll just continue calling you a punk. Daredevil: We don't have a choice. Jessica Jones: Maybe, but Luke never shuts up about asking for help when you need it. Jessica Jones: You know who I am? Wasp: For sure! You take the best candid celebrity pics. Who's a cheater? Who's a bad tipper? Who jogs on the beach shirtless even when it's way too cold out? Only Jessica Jones knows! Jessica Jones: Yeah, well, I got bills to pay. Can you get me out of this school turned prison or what? Wasp: I can do anything! But I have a friend who does this stuff even better. This is right up her alley! Jessica Jones: Great. Tell her to hurry. Wasp: Get it?! Because Hell's Kitchen has a bunch of dark alleys? Jessica Jones: It would be funnier if I wasn't currently imprisoned. Jessica Jones: You're the one who's gonna get me out of here? Black Widow: Yeah. What do you know about Kingpin? Jessica Jones: Besides that he's a jerk? He's smart. Strong. Ruthless. He thinks he runs Hell's Kitchen. Black Widow: Is he working with The Hand? Jessica Jones: Probably. I can help you find out if you can get me free. I think more clearly when I'm not being held captive. Black Widow: I like you already. Iron Man: Black Widow hacked into your school's security. It's a little more advanced than we expected, but I should be able to make something to bypass the system. Jessica Jones: Thank you. Hurry up and get me out of this place before I lose my mind. Jessica Jones: I have an invulnerable boyfriend. Kingpin: I hope you realize this isn't personal, Director Fury. The public is simply frightened by the dangers surrounding Avengers Academy, and believes new leadership could be the solution. Kingpin: I realize that admitting your mistakes and revealing your secrets is unpleasant, and that no one can force the great and powerful Nick Fury to face trial, but the public only wants to feel safe. Nick Fury: I'll go on trial. Kingpin: You will?! I mean, of course you will. It's the only option. I'll give you time to prepare your case, and arrange for representation. Nick Fury: I want Matt Murdock. Nick Fury: I'll see you in court. Daredevil: Thanks for getting me out of there, Director Fury. I'll do everything in my power to clear your name, defend Avengers Academy, and free the rest of the students from Kingpin's school. Nick Fury: Are you getting better with those powers? Daredevil: The power of attorney...? Nick Fury: I know who you are, Daredevil. I've been tracking your story since you finished your training with Stick. You're gonna represent me, but you're also gonna help me figure out what Kingpin is doing with The Hand. Daredevil: How many other people know? Daredevil: That's a relief. I literally just got a shirt made that says, "I'm Not Daredevil". Pepper Potts: Welcome to Avengers Academy, Matt! We're excited to have you here, and so happy you'll be defending Director Fury. Pepper Potts: Potts. Pepper Potts. You can call me Pepper. Can I show you to your dorm? Daredevil: Yeah, she's really friendly, and...helpful. Are you two dating? Daredevil: We're only friends, Tony. Iron Man: Yeah well, I saw the look in her eye, and that's not what she thinks. Just appreciate how lucky you are to have her look at you like that. And don't make me have to punch a blind guy. Punisher: Your samurais can't stop the Avengers. Punisher: Nobody can fix this but me. Kingpin: Respect our agreement. I promised to deliver the people who threaten Hell's Kitchen, and you promised to punish them. But not until I say it's time. Kingpin: You promised me you'd be capable of protecting the Relics until I was ready to enact the next phase of my plan. Kingpin: Are you too weak to honor your part, or are you incapable of respecting a gentleman's agreement? Nick Fury: I need your help building an Academy Courthouse, Stark. Staff it with your surveillance robots. Nick Fury: And give the robots the ability to broadcast everything live. Iron Man: What are you planning? Nick Fury: Nice work, Stark. I sort of imagined the robots just standing around the courtroom, but this is much more creative. The judge's wig is a nice touch. Iron Man: Wasp's idea. She really does have the best ideas. Most of them involve wigs. Iron Man: You're pretty calm for a guy who's about to go on trial live in front of the entire universe. Nick Fury: Nick Fury's got nothing to hide. Loki: I need to discover what these ninjas are trafficking, but I'll need one of their artifacts to access their Relics. I can sense that they're involved in something distinctly magical. Loki: Not magical as in your misguided description of fluffy puppies and sappy relationships. Literally magical, as in they're associated with powerful sorcery. Kingpin: They may access the Hand's Relics faster than I anticipated. You'll need to be prepared to dispose of them. Punisher: Why do you think I've been cracking my knuckles for the past five hours? Kingpin: I assumed it was a nervous habit. Punisher: Same thing that happens when you do anything else. You get your teeth knocked out by the Punisher. Black Widow: I need to know everything you know about Kingpin and the Hand. Loki thinks the Hand is moving something involving sorcery, and I'm almost positive Kingpin is orchestrating the whole thing. Daredevil: Who do you trust more? Loki or Kingpin? Black Widow: Is there a third option? Black Widow: I'm no magic expert, but some of what they're moving is ancient. It would be nice if I could fully trust at least one person here who uses magic. Daredevil: When Loki says your name, I can sense that he cares. When you said his name earlier, I didn't sense anything. You should be honest with him. Something tells me he doesn't deal well with having his feelings hurt. Black Widow: You don't wanna get in my personal business. Enchantress: In so many ways. Loki: The sorcery in these relics is different from anything in Asgard. Different even from the curse that embodies the Black Knight's Ebony Blade. Enchantress: The Relics have something to do with necromancy. They're likely attempting to raise someone from the dead. Loki: Good. I can prepare an appropriate spell to find out exactly what they're planning. Enchantress: You could say thank you. Loki: I could, but why start now? Loki: I understand you've taken over as ruler of Avengers Academy while the Patch-Man awaits his punishment. Pepper Potts: You really do have the worst way of phrasing things. I'm the acting Interim Director until Director Fury is finished with this ridiculous trial. Loki: You'll deny it, but I can tell you enjoy the power. Pepper Potts: Director Fury is still in power. The truth will come out soon enough. Justice will be served. Loki: Feel free to admit that the statue is magnificent. Daredevil: I'll take your word for it. Loki: Lies are my lifeblood, Blind-Man. I appreciate you deceiving everyone else, but please don't humiliate us both by acting like you can't see better than the other Midgardians. Daredevil: Fine. The statue's nice. You look good in a dress. Loki: Loki looks good in everything. Kingpin: My associates are going to deliver a pinball machine to the Academy. Punisher: You're giving 'em games? Kingpin: Violence is a simple, yet admittedly effective solution to most problems. Distractions will keep them from focusing on my true agenda. Punisher: I'll stick with violence. Loki: What is this contraption? Falcon: Pinball! You should give it a shot. It's fun. Loki: Does it involve lying? Falcon: No, but you can cheat a little bit by shaking the machine. Loki: Then Loki will be the one true ruler of all things pinball! Iron Man: I can analyze the poison the ninjas are using if you can get me some of their weapons. Wait. Why are you smiling? Black Widow: I don't need an extra reason to want awesome ninja weapons. Black Widow: Did you find out anything about the poison the ninjas are using from their weapons? Iron Man: No. Chemistry isn't really my wheelhouse. I tried Spider-Man, Black Panther, and Spider-Man 2099, but they're all busy with their own stuff. I'd ask Professor Pym, but he's acting weird. Black Widow: Let me know if you find something. The threat of getting poisoned is half the...challenge. Iron Man: You almost said fun. Black Widow: Keep that between us. I have a reputation to uphold. 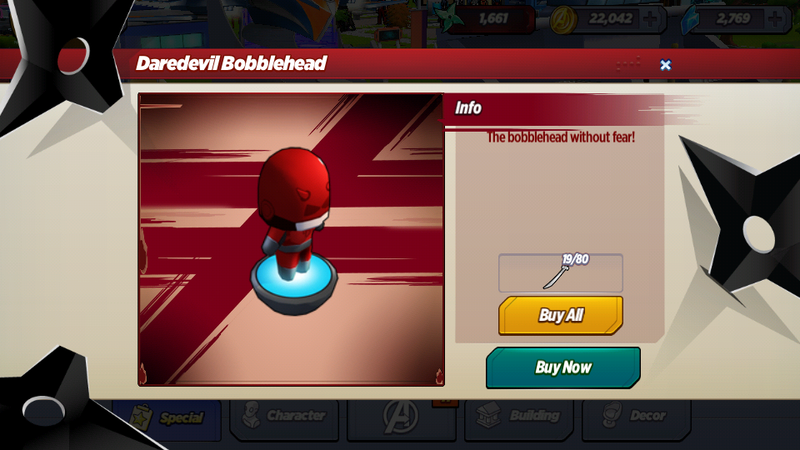 Get the Daredevil Bobblehead for 80 Katanas! What do you think of the Daredevil event so far? Are you gonna buy Jessica Jones? Don't you just love the skyline?! When fighting the ninjas the fight bare doesn't refill/show back up. I have the toxins...is your game always so buggy?